Many people who live in the Greater Golden Horseshoe (GGH) work in Toronto, but live in one of the many growing cities in the region. On a daily basis, they are challenged with organizing their lives under varying regional and municipal systems that are often competing, inefficient and generally unconnected. It is clear that there are synergies and connections between the different cities of the GGH that are happening irrespective of regional and municipal planning policies. These symbiotic relationships are not formally coordinated and are steered by the needs of people. They are extremely important to understanding the future development of the region. During 2016-17, the IwB explored the symbiosis that is occurring within the GGH. The key to our project was looking at the human experience of living across the region, and comparing it to the municipal frameworks that are currently operational. The Symbiotic Regions project seeks to uncover new value in the GGH, by demonstrating how cities can cooperate at a regional scale to better deliver services, attract investment and create more resilient social and physical infrastructure for living regionally. Symbiotic Regions is the fourth year of a five-year research trajectory set by the IwB to explore Regional Ecologies, an approach that emphasizes the study of the regional scale of cities and their surrounding areas. The Regional Ecologies Project is broken down into five different city-region types: gateway cities, divided places, interstitial zones, symbiotic regions and continuous corridors. Importantly, these categories are not exclusive; they are research themes from which the Institute is building a greater understanding of Regional Ecologies. In 2013-14, the IwB worked with the theme of Gateway Cities, looking at three case study cities that serve as gateways to their respective regions–Toronto, New York City, and Chicago. The 2014-15, Connecting Divided Places project, investigated the social, economic, environmental, and cultural divisions in Chicago, Eastpointe (Detroit), and Toronto. In 2015-16, the IwB shifted gears and looked at a small region in southwestern Ireland called County Kerry. Defining County Kerry as an ‘Interstitial Zone’, a place ‘in-between’ that has potential to be a future area of influence and vitality, the IwB students looked at ways to promote sustainable economic development in the region. For the 2016-17 Symbiotic Regions project, the IwB will connect with partners located in the Greater Golden Horseshoe (GGH) region, looking at regional organization and government. Stay tuned for the more developments on the project and the Connected & Unbound book! See the Year Highlights or contact us to find out more! During the first week of classes, the IwB students participated in an orientation session during which they explored the City of Toronto to define what symbiosis means to them. They studied and contrasted two parks in the city, and spoke to people to understand how they live, and how they use parks. They expressed their research through a physical model and a presentation. In October 2016, the IwB students, staff and faculty conducted their first charrette. During this internal charrette, the IwB students, with help from faculty, defined their values as a design studio, created four key strategies for the waterfront, and proposed 15 pilot projects for Waterfront Toronto. IwB students produced an accordion book, showcasing the projects, strategies, and values. In January 2017, the IwB students created an interactive exhibit called “Reflections” to showcase their work on Symbiotic Regions. In “Reflections”, the IwB students attempted to collect the unwritten histories of Toronto’s waterfront in order to create human-centered designs that could, in the future, inform the revitalization of Toronto’s waterfront. The IwB students collected people’s memories and stories of the waterfront through cards that were hung around the exhibition. 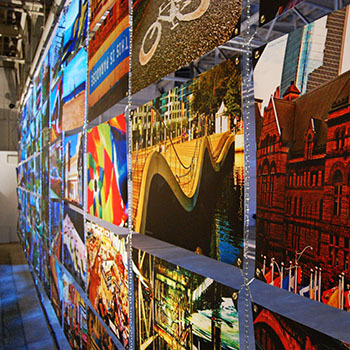 The exhibition was created in partnership with Waterfront Toronto, an organization that is undergoing the largest waterfront redevelopment project in the world. The Toronto International Charrette, called Beyond the Edge, was an intensive four-day charrette that brought together 150 students, faculty, and industry advisors from around the world to collaborate on 12 pilot concepts for the waterfront, building on the fall charrette. The collaboration led to 12 developed project concepts that could be applied at various scales in the region. The projects were categorized under three themes. The first theme, “Enhance every part of the journey”, consisted of three projects aimed at designing positive interventions along the journey to and from the waterfront. The second theme, “Showcase actionable sustainable innovation to the GGH region”, consisted of five projects and the third theme, “Create complete communities by designing the fine grain details of a neighbourhood”, consisted of four projects. At the heart of each project was the central theme: a local, regional and global waterfront. For three weeks in April 2017, the IwB students participated in individualized work placements. Students worked with organizations and companies that reflected their interests and strengths as identified during the first semester. The IwB has a wide network of past project partners with whom students can seek work placement, but they are also encouraged to branch out and work with organizations outside the IwB network. Throughout the year, the Interdisciplinary Design Strategies (IDS) class worked to understand the Greater Golden Horseshoe Region (GGH), Toronto’s waterfront, and the ways in which people living in the region experience both. At the Year End Show, the IwB students designed engagement tools to learn about the behaviors, feelings, and experiences of GGH residents, so that they could PUSH their projects for the remainder of the year. Each engagement tool informed one of the three pilot projects that the IwB students worked on for the remained for the year. The Dean’s Charrettes are a spring semester academic course open to students across the Centre for Arts, Design and Information Technology (CADIT), completed within a two-week period. The focus and themes of the 2017 Dean’s Charrettes were developed from the IDS major project as well as the Special Projects conducted by CADIT during the 2016-17 academic year. For the Dean’s Charrettes, the IwB students worked with faculty and students from different George Brown College programs, to create four projects, while working on industry projects in an intensive studio environment. 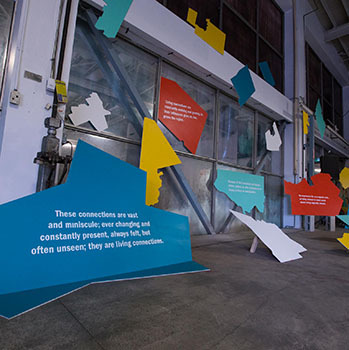 The IwB students created an exhibition called “Connected & Unbound: A new Regional Perspective”, to showcase their year’s research and insights about regions, and the three regionally-relevant waterfront pilot projects. The premise of this exhibition stated that we experience life on a regional scale, so being relevant in today’s world means being regionally relevant. 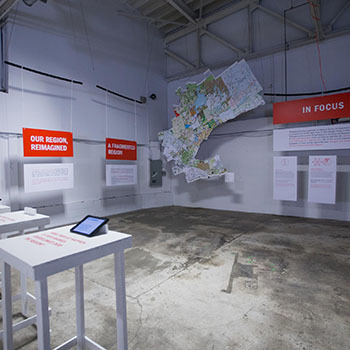 The exhibition was particularly interesting as it showcased how regional connections and phenomena can be used to develop designs for Toronto’s waterfront that impact the entire GGH region. People are already breaking barriers and carving out regional connections for themselves. How can local organizations act as catalysts for regional development? 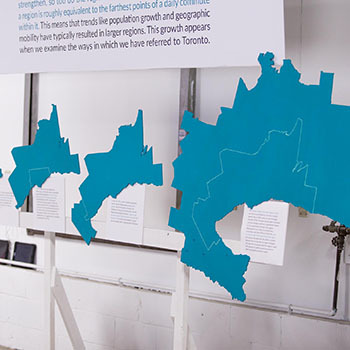 The IwB students’ work on Symbiotic Regions, guided the development of a series of prototypes to create a regionally connected waterfront in partnership with Waterfront Toronto. In our daily lives, we live beyond the borders of just one municipality. We live in a network of complex and evolving connections that make up a regional life. Living beyond the urban scale, we need to develop an understanding of the new regional scale of our lives. Regions are connected and yet unbound. Unlike cities, provinces, and towns, they are not defined by artificial boundaries. Instead, they are defined by the connections within them. Because of their complexity and dynamic nature, regions are often overlooked as we choose to focus on municipalities. We live in a network of complex and evolving connections such as economic exchange, political regulations, natural systems, shared infrastructure, knowledge sharing and shared cultural ties. Because these six complex connections are constantly changing, they are considered living connections. The partnership with Waterfront Toronto gave the IwB students the opportunity to apply the living connections and regional research to create five strategies and three broader goals that guided the developed of their designs for the waterfront. Check out the Waterfront Case Study here! The students developed three projects for the waterfront and showcased their year’s work through a publication, digital platform, and an exhibition. What if new entrepreneurs could turn empty sites into complete communities? Once Toronto’s waterfront has redeveloped, it will be home to many large-scale, mixed-use buildings that will provide thousands of individuals with places to work, live, and play. During the redevelopment period, however, there are many goods and services that are not available to those already living in waterfront neighbourhoods. The Downtown Entrepreneur Collective (DEC) is a new ground-floor-strategy that will help meet the basic needs of current and future residents, and to act as a regional destination. DEC will be a cooperative organization that will bring together community organizations, service providers, and businesses to create small retail centers in temporary, adaptable kiosks. The result will be an animated streetscape filled with everything from restaurants and bakeries, to library outposts and daycares, to bike repair shops and stationery stores. DEC will provide the region’s entrepreneurs a low-risk chance to test their concept in an emerging waterfront neighbourhood. The aim is that it will help forge long-term relationships between regional small businesses and local residents while being a waterfront destination. Canadians have named water as the most valuable natural source for 10 years in a row, yet our water-conservation efforts have actually deteriorated since 2008. We use water and understand its value, but we fail to take the actions that accompany this understanding. On a daily basis, people across the region rely on Lake Ontario for their supply of drinking water, yet we continue to treat it with disregard because we have no real emotional connection to this asset. It is out of sight and out of mind. Hello Lake is a project that will bring the lake back into the region and will bridge the current disconnect between people and the lake. It uses two types of screens to connect the region to the lake. The Signature Screen will use live feeds of the waterfront to restore the sightlines of the lake that have been obscured by construction. The restored views will remind regional residents of their proximity to the water and will be accompanied by up-to-the-minute information about the lake’s conditions and waterfront programming. The Interactive Screen will provide the same information and will incorporate a sponsored social media campaign that will raise money for conservation efforts and research on Lake Ontario. Hello Lake will bridge the widening gap between the GGH and its most valuable natural asset through raising awareness and providing information. Furthermore, the increased awareness will be able to actively impact the region through hashtag-based fundraising. It will put Lake Ontario in our sights and in our minds. What if the Martin Goodman Trail was a pathway of experiences? The Martin Goodman Trail runs along 56km of Toronto’s waterfront, connecting interesting, fun, and important destinations, yet it is sorely underutilized. Many Torontonians rarely visit because of the visual barrier created by the Gardiner Expressway, and those who only use it for exercise and active transit (instead of exploring the various opportunities it has to offer). Path Perks is a digital wayfinding strategy that will help bring regional residents to the path and that will highlight the many tours, events, and locations available just off the trail. Visitors can download the Path Perks mobile application and plan their journey to the waterfront using six categories of curated experiences: Culture, Markets, Play, Relax, Water, and Wildlife. Once on-site, two types of physical markers will create a cohesive narrative along the networks of pathways, public spaces, and communities. Universal Markers placed in strategic locations will indicate to visitors that there are opportunities for discovery just off the path. Once they have left the path, an On Site Marker will provide a visual cue that they have reached their destination. The On Site Markers will also be equipped with Augmented Reality, signaling the application to provide you with additional information. Path Perks will help bring GGH residents to the waterfront and will help regional visitors and locals alike discover the hidden gems along the Martin Goodman Trail, making connections to the waterfront stronger.